If your idea of a guard dog is a snarling Cujo patrolling a junkyard, think again. Today, many guard dogs receive specialized training to help protect law enforcement and military officers and even executives and celebrities, often at a price tag of $100,000 or more. There’s a difference between a watchdog and a guard dog. Although your golden retriever barks ferociously when someone comes to your door, chances are that the dog would lead intruders to the family silver or plant kisses all over their faces. Lot of dogs will bark to alert you to the presence of a stranger, but will they actually protect you? Or will they hightail it under the bed? For a true guard dog, you need to start with the right breed. Some dog breeds tend to have a protective instinct. 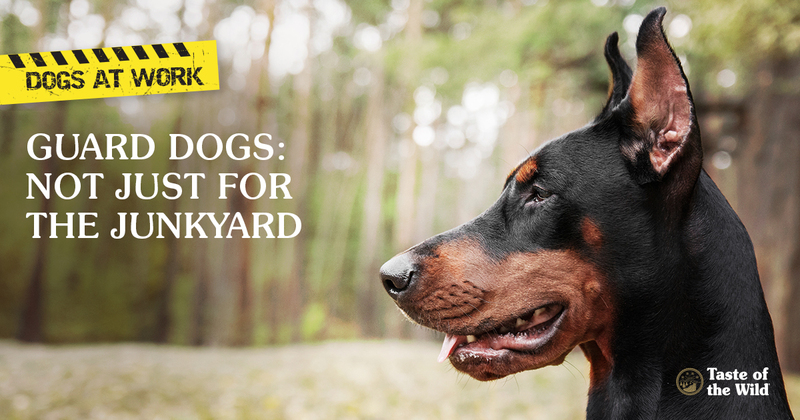 Not surprisingly, those breeds include German shepherds, Doberman pinschers and Rottweilers, dogs that might discourage intruders simply by displaying their teeth. But instinct, by itself, isn’t enough. Most guard dogs are larger in size and physically fit. They need to be intelligent and self-confident, never fearful or nervous. They need to be willing to work with a handler and follow commands. And because instinct doesn’t teach a dog how to react in different situations, they need guidance. Of course, simply buying an aggressive dog, or as some bad folks are inclined to do, abusing a dog to make it more aggressive, is never a good idea. Without proper training, positive reinforcement and socialization, these dogs can become fearful, poorly controlled liabilities through no fault of their own. In some instances, such as police and military work, dogs go through bite training. Using trainers in padded suits, dogs are taught to sink their teeth into the target’s arm with verbal commands or physical signs, and not release until they are told to do so. Ideally, the dog should also have the ability to be docile and friendly with the handler. Breeds commonly used for this kind of work include Belgian Malinois, German and Dutch shepherds. Many of the same trainers who work with dogs for the police and military are finding that celebrities and executives will pay high prices for 24/7 personal-protection dogs. Often taking the place of bodyguards, these dogs may be charged with patrolling 25,000-square-foot homes while also serving as pets. Other types of guard dogs are used to protect livestock. Not to be confused with herding dogs and all-around farm dogs that are trained to keep cattle in line, the job of a livestock guard dog is to stay with the herd day and night and fight off potential predators such as wolves, bears and coyotes. These protectors are generally raised with the livestock so they bond with them rather than consider them prey. The livestock, in turn, are not afraid of the dogs. Typically, U.S. producers have relied on large-breed white dogs for guarding sheep, such as Great Pyrenees, that can blend in with the sheep herd. But recently, the U.S. Agriculture Department has imported unique dog breeds from Europe and Asia to help fend off wolves from sheep herds in the West. For trained guard dogs, tracking down perps, pursing intruders or challenging wolves is all in a day’s work.